In presenting my third annual report, I desire to congratulate ourselves that we have now come into our own, and that the Edward Devotion House, for at least the next two years, will be in the possession of our Society; the vote of the town giving the Selectmen authority to transfer the building from the Edward Devotion House Association to the Brookline Historical Society on the same terms, passed at the town meeting held December 29, 1911, was promptly ratified by the Selectmen, and notice of the same has been sent to me, as President. While this may be a subject of rejoicing, it also means renewed and increased responsibility on the part of our members to continue the good work done by the Edward Devotion House Association, to whom we should be most grateful for putting the building in order, and caring for it, for the past three years. On the first of January, 1911, the Society's membership was 165. Of these 4 were benefactors, 19 were life members, 142 were annual members and one was a corresponding member. On January 1, 1912, the total membership was 203; benefactors, 4; life members, 22; annual members 176 and 1 corresponding member, a gain of 38. Two members have died during the past year, and one who died in 1908 has not before been mentioned. This was Benjamin F. Adams, who was of the firm of Adams & Armstrong, grocers on Beacon street, near Coolidge Corner. He resided in Belmont, and though interested in Brookline affairs, did not attend any of our meetings. Col. Albert A. Clarke died July 16 at his summer home in Highgate, Vermont. Colonel Clarke was a recent comer to Brookline, and had not taken any part in our Society. He was well known from his connection with the Home Market Club of Boston, having served for many years as its secretary. Oscar B. Mowry, who died August 19, was one of our best known residents. He was a lawyer and a trustee of many estates. He was also chairman of the Water Board for many years and a good citizen. The death of Levi L. Willcutt is also mentioned, although it did not occur until January 3 of the present year. 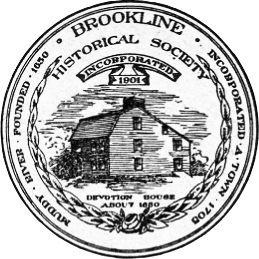 Mr. Willcutt moved to Brookline in 1887, having previously resided in West Roxbury. He was formerly greatly interested in the affairs of the city of Boston, having served in the common council and he was also for two years in the Massachusetts legislature. He had for many years been a member and one of the directors of the Bostonian Society, and greatly interested in its success. He was in his eighty-sixth year. He was a most kindly man, and interested in the welfare of our town. During the years 1910-11, the Society has held eight regular meetings, of which that of May 24, 1911, was in the Grand Army Room of the Town Hall, all others being held in the Edward Devotion House. The average attendance was considerably more than for the past two or three years. January 18. Annual meeting and choice of officers. The President in his report gave a description of the more modern occupation of the Devotion farm by George Babcock. February 22. "Washington's visits to Boston," by Mr. Charles F. Read. The first, in 1756 when Washington was a civil engineer; the second, when he took command of the army in 1775; and the third 1789 during his first term of office as president. March 15. "How time was kept when we lived under a King." by Mr. John Albree of Swampscott. April 19. "Four mounted messengers of the Revolution," by Vice-President, William O. Comstock. May 24. "Personal reminiscences of the Civil War," by Major Horace P. Williams of Roxbury. Major Williams went to the war as captain of Co. K, Twenty-Second Regiment, Mass. Volunteers. This was one of the so-called Wilson Regiments, largely recruited under the auspices of Hon. Henry Wilson, then U. S. Senator from this state. October 18. "John Trumbull, the painter of the Revolution," by Mr. Samuel Abbott of Newton. The two pictures which have made Trumbull famous are, the battle of Bunker Hill and death of Warren, and the signing of the Declaration of Independence. Mr. Abbott's description and history of the man was very interesting. November 16. "The German Element in America in the Revolutionary War," by Rev. J. F. Meyer of South Natick. December 20. "Pilgrim and Puritan; his place in colonial history," by Mrs. Marian Longfellow O'Donoghue of Brookline. Mrs. O'Donoghue, who is a niece of the poet Longfellow, took for her representative of the Pilgrims, John Alden, and of the Puritans, John Winthrop. The paper was most ably written and interestingly delivered. Our publications are more and more in demand. I was only a few days ago in receipt of a letter from the librarian of Yale University asking for a set of them. The growth of our town continues, particularly in apartment houses. It seems as if this business would some day be overdone. It is gratifying to note the erection of a large business building in Brookline lower village, and it is rumored that more will soon be built. That important entrance to our town has too long been a disgrace, and let us hope that, now a beginning has been made there, the situation will ere long be improved. In my annual address of last year I gave some description of the Devotion House during its occupancy by Mr. Babcock. I shall have tonight a few words to say of the piece of land lying to the north of the Babcock place, and what is a continuation and ending of the Babcock hill. The passerby of today, going towards Allston, after crossing Thorndike street, will see a rather melancholy deserted house, looking as if it were about to slide down the gravel bank towards Harvard street. The gravel has been carted away from all sides of the house, the driveway has been cut down, the house and stable are dilapidated and going to decay: but sixty years ago this was one of the prettiest places in this part of our town, and was the home of wealth and happiness. The grounds were well wooded, they gradually sloped to the north, the west, and south, and with a fine view of the adjacent farms, and beyond to Charles River and Cambridge. The house was in a most commanding situation. This land, a part of which is in Boston,- then Brighton,- was formerly owned by Mr. D. S. Coolidge, who lived directly opposite, and whose son and daughter still live on the old place, and it was a part of the Coolidge farm. In riding in the elevated train from Dudley street to the city one passes about midway between the Cathedral and Dover street three or four old-fashioned, three-storied, flat-roofed houses with the ends to Washington street and the entrances on the side. In one of these, in 1845, lived Mr. Holmes Hinckley, the senior partner of the Hinckley & Drury, afterwards the Hinckley & Williams Locomotive Works. This establishment was on Albany street, directly behind the house, and extending through to Harrison avenue, and this land is now owned and occupied by the Boston Elevated R. R. Co. as a power-house and for other purposes. At that time the business of locomotive building was very prosperous, and one of the occasional sights in the city was the transportation of one of the locomotive engines, built here, across the city to one of the railroad stations. The power used in hauling these engines was sixteen or eighteen horses, in a string team, and guided by three or more drivers placed at intervals of the team. Imagine such a team today threading its way through the crowded streets of Boston. My father knew Mr. Hinckley well, and I remember as a small boy going with him to call there. A pretty garden was directly behind the house and there was a path which led across to the works. Mr. Hinckley had a growing family and was anxious to move into the country, and my father recommended this land on Harvard street as a good site for a home, and Mr. Hinckley bought the land and built a fine house and out-buildings. There are nine and a half acres in Brookline, and perhaps a couple of acres across the line in Brighton. I well remember the house-warming given by Mr. Hinckley and his fine family. One of the daughters married Cyrus Alger, who during the Civil War cast cannon for the government at their factory in South Boston, at the further end of Dover street bridge. Another married George Hill, a son of the man who built and lived in the house on Kennard road now occupied by Mr. Ogden. She is still living, a widow, in Wellesley. With the new, handsome house, and the family of lively and pretty daughters, it was a pleasant place for the young people of the town to visit, and I can recall many evenings spent at their home. It was rather isolated. The only way of transportation to Boston was by rail from the Allston station, at that time called Cambridge crossing, and Mr. Hinckley kept a number of horses and carriages. As I have said, when Mr. Hinckley first came to Brookline, his business was very lucrative, but soon after 1850 other and larger establishments started in various parts of the country, such as the Baldwin Locomotive Works in Philadelphia, and with their improved facilities and the gradual demands for larger and more powerful engines, he could not compete with his rivals, and soon after he failed in business. I think he died in this house about 1854 or 1855, though I cannot positively say, but his family moved away about that time. In 1857 Mr. Shadrach Robinson, a wholesale dealer in flour, bought the place and lived there until 1866. I did not know his family, but often saw him riding by in his carriage to Boston. In 1867 Mr. Alanson W. Beard bought the place. He was a Boston merchant and later a politician, and while living here, was, I think, the collector of the port of Boston. Mr. Beard moved away in 1872, and Mrs. Mary L. Murray came into possession. She was a widow with several sons, but I did not know them. She lived there until 1876, when the Ayer family of Lowell, who held a large mortgage on the property, took possession under foreclosure. Since that date the house has had a checkered career. For a number of years it was let for a tavern or road house, and several times the proprietors were indicted for keeping a nuisance. After the town had voted no license there were numerous raids and seizures of liquors, and finally this business was given up. Stories were told of the proprietors getting an inkling of a raid, and the stuff would be carried across the town line, until the officers had gone. Then the place was rented to different parties, but for a number of years the house has been boarded up and the place deserted. From the piazzas, which are on three sides of the house, one may look down on the houses built on the Babcock and Coolidge farms and on the north and west on the rows of apartment houses on Commonwealth avenue, but the immediate surroundings suggest anything but growth. There is a pretty back entrance to the place, a driveway shaded with elms, which Mr. Hinckley set out. This is on level ground and has not been disturbed by gravel buyers. It is fortunate that the present owners are wealthy, for the interest and taxes during the thirty-five years of their ownership must have greatly exceeded the present valuation, large as it is. It is interesting to note the changes in the assessors' valuations since the house was built. The first year that Mr. Hinckley built, the place was assessed at $30,000. During Mr. Robinson's ownership it varied from $18,000 to $25,000. In Mr. Beard's time, from $20,000 to $27,000, while during Mrs. Murray's occupancy it rose to $60,000, and since the Ayers have owned it the valuation has increased from $40,000 to $150,000. It now seems a veritable castle in the air, perched up above the surrounding territory and with no direct means of approach. But even today anyone viewing the house at close range must see what a fine, well-built mansion it formerly was. It is indeed pitiable to see its gradual decay. It would be impossible for the recent dweller in Brookline for five, ten, or even twenty-five years, to imagine the appearance of things here sixty or sixty-five years ago. Harvard street was a narrow, crooked road, only lately arrived at the dignity of a street, and known among the older people as the "Cambridge road." The only houses on it between School street and the Brighton line were seven or eight farmhouses, - good, commodious dwellings, but devoid of any attempt at beauty; and attached were numerous outbuildings in a more or less untidy condition, with pigpens and manure piles, suggestive of anything but cleanliness or order. And the occupants themselves, good, sterling people, but the men with their woolen frocks and cowhide boots, with trousers tucked in in winter, and overalls and shirt sleeves in summer, and the women hardly to be seen except on Sundays, did not satisfy the eye or the taste of one inclined to be esthetic or fastidious. And to have a business man from the city come out and build a stately, beautiful house, to surround it with a garden and trees and lawn, and to bring to it his large family, with their culture and refinement, was indeed a godsend to the neighborhood. It really was the only house with any pretensions to beauty in this part of the town, and it and the family were gladly welcomed. And to contrast this condition with the present is indeed far from pleasant. Let us hope that the present owners may soon see that it is for their advantage to take some steps to improve their property. the foregoing record is truly compared with ye original by me Edward White T. Clerk." James Allin was the first minister of the town, chosen at a meeting held December 10, 1716. This house of Amos Gates must have been destroyed very many years ago, as I have never heard it mentioned by my father or grandfather. It may have stood on the northerly portion of the Devotion estate. I would again remind the Society of the increased responsibilities imposed upon it by the acquisition of the Devotion House, and I would suggest that the committee on rooms should have immediate charge of it. I trust that the coming year may be a profitable one for us.